I’ve always been an advocate for the combination of Spoken Word and music. Some say it distracts the listeners attention from the poets words or that by putting a track behind the verses it becomes some unknow random half brother of Rap music where the MC spits differently (this is certainly not the case). For me combining the words of a poet with music allows the words to reach new ears and touch new people that it wouldn’t have if it were just spoken or written. An artform and genre within its own right. However if done correctly it can do more. The music can embrace the words and enable them to weave into one another seamlessly and allow both to leave a stronger impression on the listener. 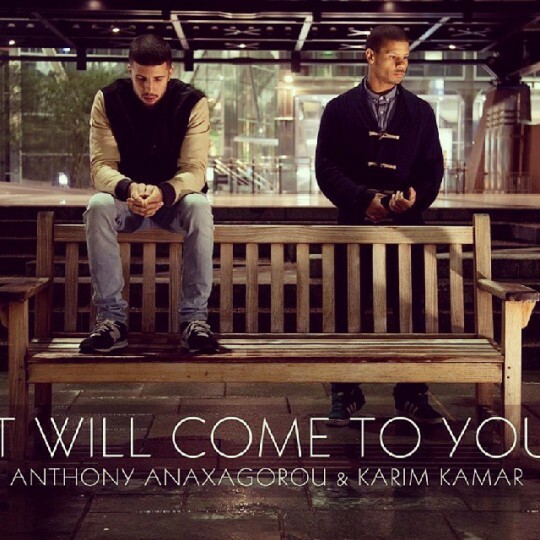 The new EP from Anthony Anaxagorou and Karim Kamar does just that. Anthony has always been a powerful poet with his performances over the last couple of years leading to much acclaim and opportunities. Teaming up with the equally gifted Karim Kamar’s classical piano compositions works wonders. The two combine their arts in perfect harmony. Complementing each other throughout Karim’s Piano shines a new light on Anthony’s pieces helping them find a new beauty whilst Anthony is able to shine a light on Karim’s compositions that people will now begin to take more note of. My favourite is “Give Hope”. Like any good song there is something people can relate to in there. I’ve heard Anthony perform this before but something about the piano that just helps each line resonate a little deeper within. The track just stands above the rest. This is not to put down everything else on the EP the level of quality throughout is second to none and there is at least one line and chord in each track that will touch you. If you’re not convinced by my words get down to the launch at Bedroom Bar Shoreditch tonight and experience it live or just download the EP now. Its an experience that will not disappoint. Purchase the ep here.